Finally, here is our next Episode, 36: “Rise.” On this episode Tom and I will be discussing the novel Dark Lord: The Rise of Dark Vader, by James Luceno. This novel takes place right after the events of Revenge of the Sith, and it one of our favorites. Spoiler... 5 DS for sure. For my Collecting & Gaming news, follow the below news. If you listened to after the credits, you’ll know that we are starting a new Podcast based on our faith and belief that Jesus Christ is Lord and Savior. We also threw out that at this time we don’t have a name and could really use your help. So send them in. Well that’s it for Episode 36. Our next episode will be on the Legacy comic series, beginning with the first story arc, Broken. We aren’t sure when this episode will be out, so stay tuned. Thanks for listening, and as always, May the Force Be With You! EPISODE 35 - "TAKE 2"
Hey everyone, here is Episode 35- "Take 2". Enjoy the episode, and look for the show notes to come out this weekend. EPISODE 34 - "NO PRISONERS"
We know, we know, we know... we're late... again! But hey, better than never, right? Well, you decide. This is our first "Real" episode in the new format. Let us know what you think of Episode 34: "No Prisoners"
On this episode, we will review, or shall we say, talk about, the novel "No Prisoner" by Karen Travis. Also, we discuss the below items in our, "Previously called News Section, but now it's just a free for all talk about whatever we come up with" section... hmmm. One of the items talk about is the Keyboard, Mouse and other released for the PC. Use the pic-link below to head over and check them out. If you want to buy them, hope you bring you credits... lots of credits. Well, that's it for this Episode. Hope you enjoy it. And, as always, May the Force be with you! EPISODE 33 - "AND THE WINNER IS..."
Hey everyone, here is Episode 33: "The Winner is..."
On this episode, we announce the winner of our contest, sponsored by http://www.buystarwarscostumes.com/. Also, we have some emails to read, and something special at the end. Send us your emails on what you would like us to start out with in 2012. Merry Christmas and Happy New Year, and as always, May the Force Be With You! EPISODE 32 - "INSERT TITLE HERE"
Yes, your eyes are not deceiving you, this is a new episode. We know, finally, right? Technically this isn't our come back episode, but rather how we are going to be doing our show, when we do come back "officially" in January of 2012. There might be another episode before the end of the year, but it will be some kind of Escape Pod. Now, unlike other shows, the show notes are not on this post with the episode. That will be coming some time in the next few days. Enjoy the show, and please, please send us your emails, feedback and comments. And as always.... May the Force Be With You!!! EPISODE 31 - "FAN FICTION, THAT'S A WRAP AND DON'T FORGET TO TURN OUT THE LIGHTS"
Sorry it's been awhile guys, but hey we are back with another episode, 31, "Fan Fiction, That's a Wrap and Don't Forget to Turn out the Lights!" Could we have come up with a longer title? Hmmm, probably not. For this episode, like the title suggests, we bring you fan fiction from two listeners, have your emails, news (books, comics, collectibles), and a big announcement at the end of the show. During our emails we talk about the Qui-Gon figure from Batman Begins, what do you think? For my collecting news, see below images. As for gaming news, just four peices of info here from THE OLD REPUBLIC, one of which I missed on our last show. Well, that's it for Episode 31. As for what we have coming up next, you'll need to listen to this one to find that out. Also, once you here our announcement, please send us in some emails with your thoughts. So, that's a wrap, and as always, May the Force Be With You!!! EPISODE 30 - "DUELING AMBITIONS"
Hey there EU fans, Tom and I, are finally posting a show after the whole site-switching fiasco. And we want to send out a special thank you to Andrew & Joe for helping make the switch as painless as possible. Only a few battle scars guys, only a few. For this episode we will be reviewing the TPB, Dueling Ambitions, from the Knights of the Old Republic series. We will also have your emails, some news, and a litle something different with the review. With the change in the way we will be presenting the review, we are looking for your feedback on whether you like the new style or not. During our emails we mention a few conventions, Marcon and The Calgary Comic & Entertainment Exp. Use the picture links to find out more information. Here are the comics that Tom gave us the release dates on. For collecting news, we talk about a minibust, Gentle Giant vintage figures, and a Darth Talon statue. In gaming news, we discussed some articles over at The Old Republic website. Check them out here. Well, that wraps up another episode of the Unknown Regions. Hope you enjoyed this one, and be looking for our next show, an Escape Pod, sometime mid-April. Be sure to send us your feedback at our email address, or check us out on our Facebook page. Until then, may the Force be with you! EPISODE 29 - "FORCING THE ISSUE"
Yes everyone, we are still alive, and here is our next show to prove it, Episode 29: Forcing the Issue. In this episode, we will be having our normal segments of Emails & News, however we will be forgoing any review this time to have a discussion on the Force with a couple special guests. In our news segment, Tom starts out with the latest release dates for the some books, comics, an e-book, and a short story by Timothy Zahn, entitled, "Judge's Call." Which can be accessed by going over to our Facebook discussion page. The e-book is the next book in the "Lost Tribe of the Sith" series, Sentinel. Since the e-book is now out, use the picture link below, or the sidebar, to access the PDF file. Continuing with our news, I bring you some mini-bust info for collecting. See links for more info. And for gaming, just the typical updates to THE OLD REPUBLIC website, mainly the Flashpoint missions. You can use the picture link below for the TOR Flashpoint missions. For the other updates talked about, use the Holocron link on the sidebar of our website. So that wraps up this episode, we hope you enjoy it. Be looking for an Escape Pod in the next few weeks on the comics Star Wars: Jango Fett and Star Wars: Zam Wesell. Until then, May the Force be with you! Hey everyone, we're back! Not that we really went anywhere, we just had a bunch of real life issues get in the way. So now that, is out of the way, here is Episode 28: "Jaster's Legacy"
Before I get into the bulk of this episode, I would like to direct you over to a Facebook page. Rob, who has done many voices for our show, is showing off his artwork, and we think you should check it out. In this episode, we will reviewing the trade paper-back, JANGO FETT: OPEN SEASONS. We'll also have your emails, news and the return of our Encyclopedia moments. Now, with our news segment, Tom has the latest release dates for the below books. He also lets us know that the Republic Commando entry over at Starwars.com is back up. You can click on the RC image and head over there to check it out if you have not already done so. And for gaming and collection news, I let you know about the release date for LEGO STAR WARS III: THE CLONE WARS, some really cool new characters for THE OLD REPUBLIC & good articles too (which you can click the Holonet image below and check them out), and also I give you Gentle Giant Mini Bust & website news. Use the links below to snag them up. Well, that's all for this episode. We hope you enjoy it, and please send us in you emails and comments. So as always, May the Force be with you! EPISODE 27 - "INTERVIEW WITH A ZOMBIE"
Well listeners, here is our last show of the year, Episode 27: Interview with a Zombie. On this show, Tom and I have our first interview, and it's with Joe Schreiber, author of Death Troopers and Red Harvest. We also have your emails and some news. Be on the lookout on our Facebook page for a Listener Photo album. That's right, when you send us photos, we are going to put them up there. You can click the link on our sidebar to head on over to our Facebook page, if you haven't done so already. Again we would like to thank Mr. Schreiber for coming on with us. We hope all of you listeners enjoy the interview as much as we did. 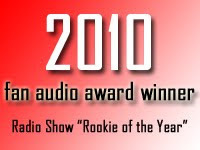 This will be the last show this year, so look for something new from us sometime around the middle of January 2011. So until then, May the Force be with you! Were you wondering if there was more to the Star Wars universe than just the movies? Wanting to know what happened before Palpatine's rise to power, and after his fall down the Death Star's shaft? Then join us at The Unknown Regions for in depth look at the Star Wars Expanded Universe. MAY THE FORCE BE WITH YOU... Travel theme. Theme images by mammuth. Powered by Blogger.